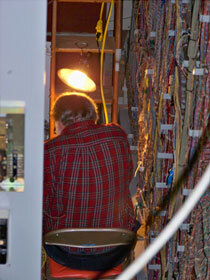 About The Museum - The Telephone Museum is operated by The New England Museum of Telephony, Inc. 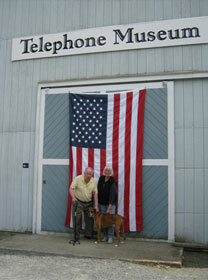 THE NEW ENGLAND MUSEUM OF TELEPHONY, INC.
is a 501.c.3 non-profit organization doing business as The Telephone Museum in Ellsworth, Maine. OUR MISSION is to demonstrate the social and technical significance of the telephone network as it existed from 1876 to the present, using working equipment to provide tangible, operable evidence of an evolving technology. WE CELEBRATE the inventiveness, craftsmanship, ingenuity and industry of the telecommunications community through educational programs, exhibits and special events. FOUNDED IN 1984, as the breakup of the Bell System was occurring, The New England Museum of Telephony, Inc. was created in reaction to the loss of an unusual switching system known as “Panel”. After older, more established museums failed to save the switch, it was sent to the scrap yard. Its fate encouraged the founders to continue to collect – before all evidence of the wired network, especially the larger switching systems, had vanished. THE LOCATION IN ELLSWORTH, MAINE was offered to the founders shortly after incorporation. The advantage of having an enormous amount of space to set up, exhibit and operate equipment, as well as to expand to other buildings, was irresistible. And the beautiful countryside of rural Maine, the location’s proximity to Acadia National Park and the cities of Ellsworth and Bangor, were suggestive of a tourist destination. EXPLORE THE PAGES OF THIS WEBSITE to learn more about The Telephone Museum. But remember, the story is long, filled with interesting characters, mind-bending machinery, and connections to today’s world. Your first visit will just keep you wanting to learn more.